About "A Walk in the Park"
Bob Dylan once said writing songs is mathematical, intimating that at its highest level, songwriting is mostly a process of working out how things go together (or come apart) to create a finished work that makes sense. And in some ways, figuring out why you like the music you like is a pretty similar process. When you look back at the music you've liked for a long period of time, you'll probably find some little surprises among the big hits and well-known artists. Looking ahead is always a bit trickier, though, when you try to project how you'll feel about a current favorite somewhere down the road. In many cases, the common denominator will be pretty simple: the music that sticks around is the music that sounds best. And in the case of Keeping the Dream Alive, it's the distinctive nature of the sound that gives this collection of bluesy, driving roots rock its unique character. The opener, "Lotto Dust," is a classic blues parable about the power and peril of dreams gone wrong. 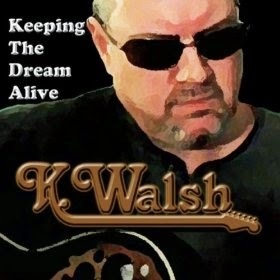 The narrative draws poignancy from the counterpoint of Walsh's strong, quiet tenor and the warm chorus of backup vocals — a good example of how the mix supports the theme and coloring of the songs. As the signature song of the group, the driving uptempo instrumental "Keeping the Dream Alive" is a good summation of the artist's influences and interests. While carefully controlled, in keeping with the overall production, it also gives free rein to elements of the classic and progressive rock that permeate a great deal of his musical heritage, and which are also evident in his live performances (where he's been known to roll out deep-catalog covers such as Jethro Tull's "One Brown Mouse," for example). "Hurtin' Up My Heart" features a bright multi-tracked rhythm vamp and the sort of heavy lead guitar that distinguishes classic funk and soul. The song's simple blues structure anchors a retro tone that's accentuated by its "old soul" lyrics, and the buoyancy of the rhythm creates an end result that is actually dance-friendly, in an old school reggae sort of way. For me personally, as familiar as I am with the artist and his musical interests, the most revelatory song of this collection is the instrumental "Aloft." Straying from the core blues of the other compositions in the group, this foray into a sort of short form progressive rock is a definitive statement of sophistication and maturity by someone with a deep understanding and appreciation of the influences that have shaped modern popular music, and which have also informed his own musical journey. "Every Day She's Gone" is another straight blues, and also serves as a good example of how the artist's careful attention to detail, in lyric and melody, helps to fully express the intended sentiments of the song. There is a stony finality to its theme of accepting loss while still remaining connected to the emotions that make memories meaningful in the first place, and as such, it serves as a fitting, dignified valedictory to the collection. In each particular expression of its overall themes, and particularly in the careful crafting of the distinctive sound of the recordings as a whole, this long-awaited collection is every bit the compendium of musical styles and technical skill that fans have come to expect, and to cherish, from this excellent singer songwriter. It is music well worth having, and quick to join your short list of favorite recordings. Patrick J. Walsh is the author of Spaceflight: A Historical Encyclopedia (2010) and Echoes Among the Stars (2000). © Patrick J. Walsh. Theme images by gaffera. Powered by Blogger.